Dineo Seshee Bopape’s installation at Art in General is a powerful evocation of what’s happening to the earth under our collective care. First, you encounter the smell of sage. It’s been burnt here, as though the room has been smudged. The space is also full of the aroma of earth, a round scent that strikes you as wholesome and nourishing. Then you see why: there are huge squares of earth, like plots of land excavated in one fell swoop. You encounter the earth and sense that it’s very much like a body: it has weight, presence, and can be exhausted, wrung out, left shrinking in the bleaching sun. There are artifacts here, too, traces of what went on on this ground before you arrived. Little stammers — not quite language, not quite image, not really signs, but remnants on the squares of earth. A collection of soft, multicolored petals forms a bed for a gold figurine of a rabbit. Nearby, a small colony of clay shapes that might have been squeezed between human fingers lays in a row; elsewhere they form a haphazard cluster, as if fashioned and then tossed aside after their original purpose was forgotten, or they were simply no longer necessary. There are both convexities and concavities — mounds of flour or salt — and declivities containing resolutely green leaves and cowrie shells. 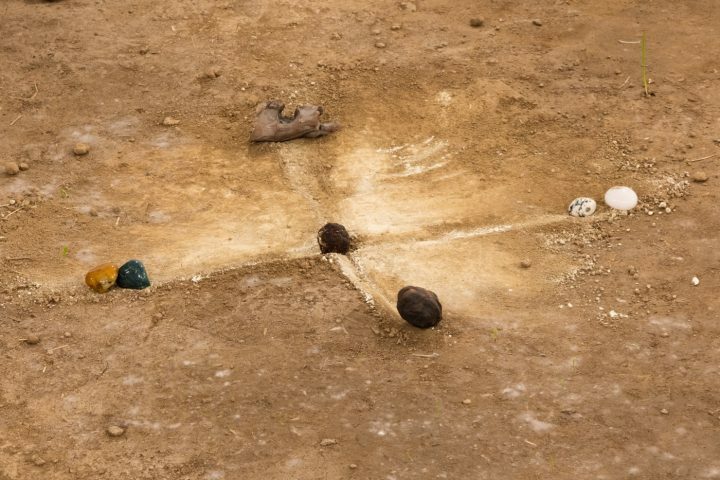 Also, you see cross patterns incised into the soil with small stones arranged on them, they and the shallow pits perhaps referencing the games Morabaraba and Diketo. 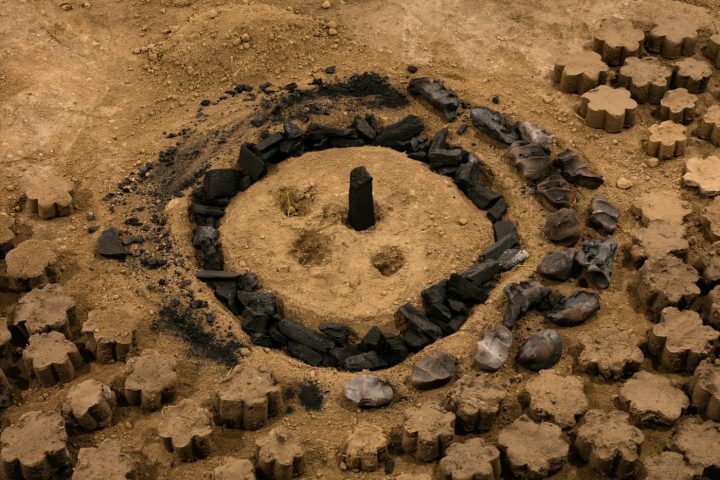 And then a small tower, circled by a moat filled with burnt wood chips, further surrounded by florets of earth, a forest of them, as if this scene were a maquette of a moment of civilization that had passed but was not forgotten, unknown to me but clearly significant to the artist. 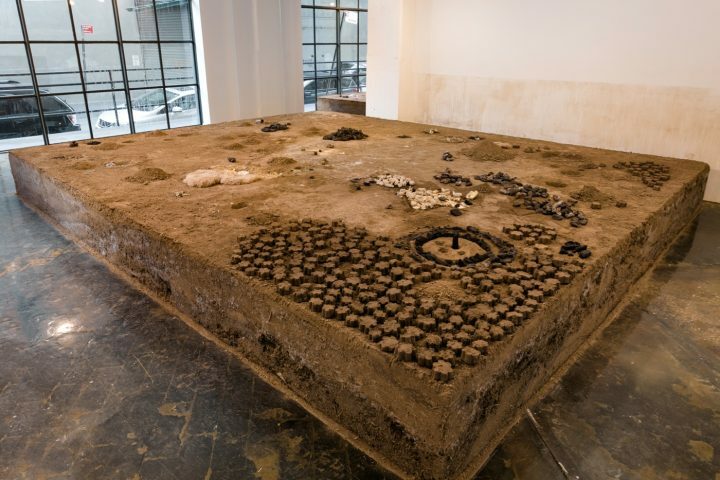 This installation by 35-year-old South African artist Dineo Seshee Bopape at Art in General is titled “sa ____ ke lerole, (sa lerole ke ___),” which translates to “that which is of __ is dust, (that which is of dust is __).” It’s a compelling work that impressed itself upon me as a powerful evocation of what’s happening to the earth under our collective care. So much of it is about what was. 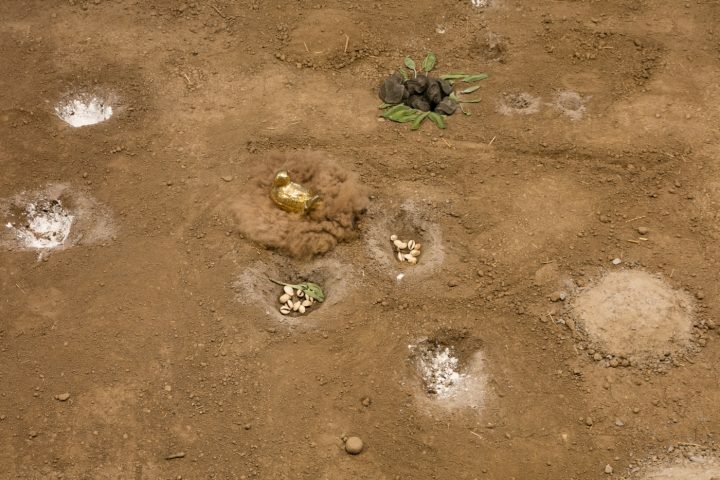 Not only the aftermath of games, ritual objects, and gifts left behind, but also what was rich and ebullient soil slowly losing its life-sustaining properties to the harshness of the brittle city air. The soil drying out in this place is a sign — a representation of the process of losing vitality, the changing of earth to dust. Dineo Seshee Bopape’s “sa ____ ke lerole, (sa lerole ke ___)” continues at Art in General (145 Plymouth Street, Dumbo, Brooklyn) through January 14.